Did Someone Mention The Steps? When the Great Wall was constructed, the designers intentionally varied the height of the steps to upset any running charge by invaders. 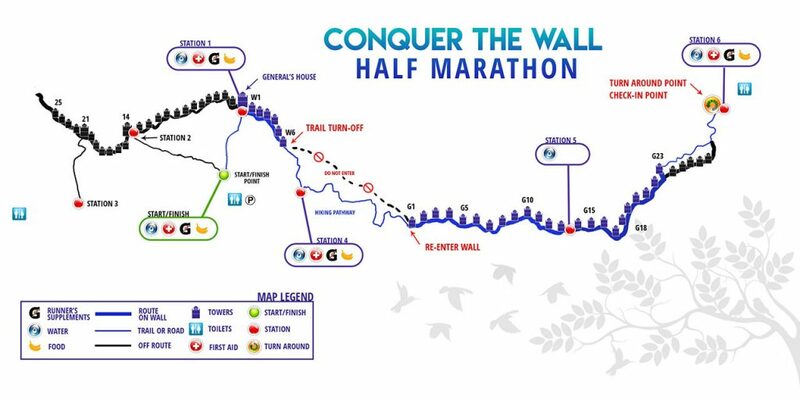 It’s a design strategy which has also upset the thousands of runners from around the world who try to conquer the wall each year. The over 20,000 steps you will encounter will vary in height from a few centimeters to over 40 cm in height. Many of the original sections of the wall have a little more than a foot of rubble you’ll be trying to run on, use caution. The message here is to train for rugged conditions, train climbing stairs & hills, and descending stairs & hills, it will all help you in this amazing endeavor! The average temperature the second week of May is 21.8°C / 71.2°F . The temperature has been as high as 27.3°C / 81.1°F and as low as 15.1°C / 59.2°F. The area of the race has very little rain fall: an average of only 6 rainy days in May, and plenty of sunshine. Generally, the morning will be cool (sometimes chilly), but it will warm up quickly through the day. 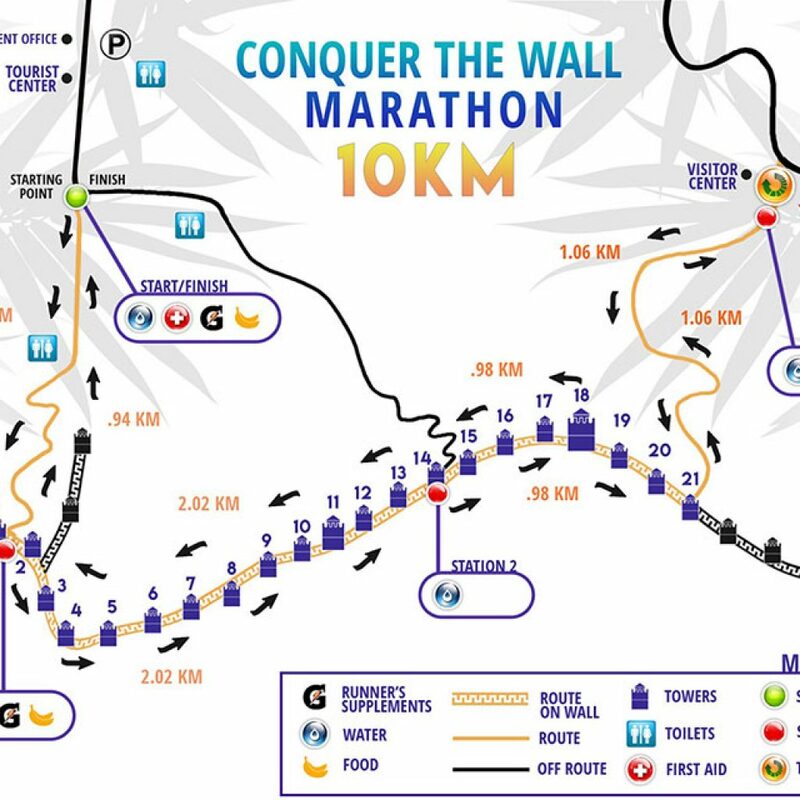 With more than 30km of the 42km being run on the wall, there will be very little shade, so a running hat and/or sunscreen is highly recommended. Sunrise on race day is about 5:15 am – 45 minutes before the start of the race. We recommend trail shoes with good tread and grip. When running the newer section of the Wall (Jinshanling) you want shoes that will grip the bricks, the bricks tend to be slippery with the flat surface and fine grout that has come loose from the wall. When running on the trail section (around the military section of the wall) there are some steep areas with a lot of loose dirt/sand, use caution, a pair of shoes with good tread will assist you in staying upright. The Gubeikou section of the wall is a little easier than the Jinshanling, section, although still difficult, much of it is runnable due to a lot of the brick stairs being nonexistent or deteriorated, trail shoes are favored in this area as well. It is important to reduce your dehydration risk before, during and after the race, drink the proper amount of fluid. While training for this race practices drinking more water than you are used to, electrolyte drinks and eating food, so you know what your body will handle in a long endurance event like this. We REQUIRE runners use a hydration pack and/or handheld water bottles (a minimum of 20 ounces of water or electrolyte replacement drink at the start of the race). There will be water stations along the course: the farthest distance between water stations is 10k. 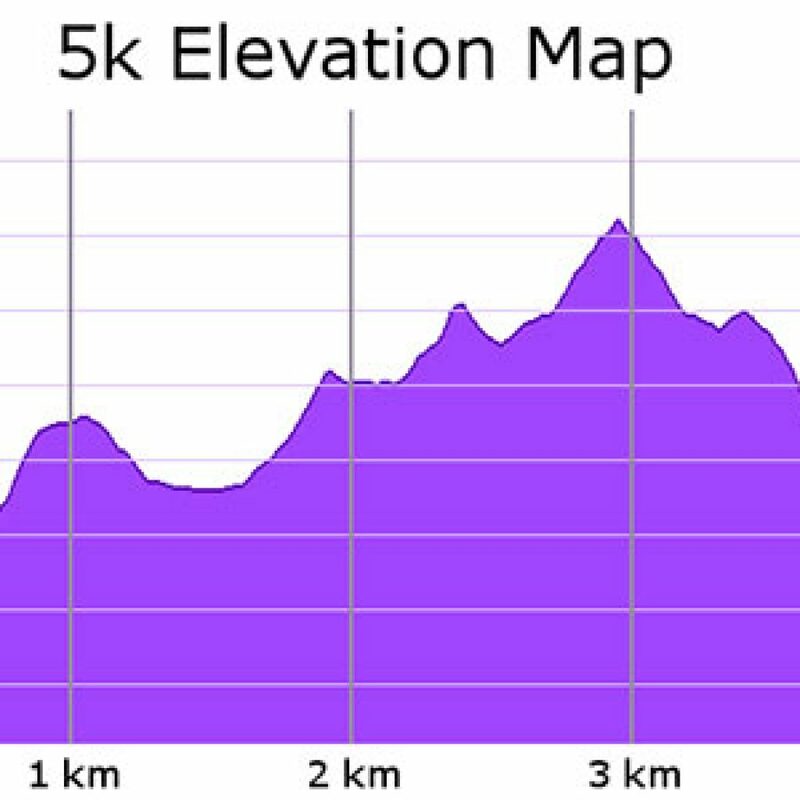 This is a very strenuous course, if you normally go through 1-10 ounce water bottle in 10k, you may go through double that amount on this course, it will take you much longer to run 10k here than on the road or easy trail at home. As the day goes on (and it heats up) your body will naturally require more fluids, please plan accordingly. Completing the race in a severely dehydrated state is very dangerous for runners in any endurance event, since you will spend a lot of time running, hiking, and climbing the Great Wall your risk will be higher than the average. After the race ensure that you continue drinking water (fluids) and make sure that you have urinated BEFORE getting on the bus back to Beijing. If you can urinate your kidneys are working and you should be in good shape for the journey home. On race morning a light breakfast (possibly water, bagels, bananas, and juice) will be provided for all runners at the host/departure hotel. The bus ride to the start is about 2.5 hours. We recommended you eat your breakfast at least 2 hours before the start of your race. If you have a special diet or require more food or fluids than we are providing either bring your diet from home or purchase food/fluids at one of the local stores the day before the race. There are a few really nice stores with international food close to the host hotel. We will have full aid stations at stations 1,3,4 & 6 containing energy gels, an electrolyte capsules, cookies, pretzels, chips, candies, an electrolyte drink, water, and possibly other items. The items at these aid stations we bring from the United States so you don’t have to worry about trying to adjust to local Chinese snacks. In 2017 we had Pringles Potato Chips, Oreo Cookies, Fig Newton’s, Swedish Fish, Pretzels, Vanilla Sugar Wafers, Cheez-Its, Gimbal’s Jelly Beans, Honey Stinger Gels, Honey Stinger Chews & Honey Stinger Waffles, Gatorade, and S-Caps (Succeed Electrolyte Capsules). Aid stations 2 & 5 will only have water due to the difficulty in getting supplies to these areas. We will provide a light lunch, snacks, electrolyte capsules, water, and an electrolyte drink near the finish of the race for all runners. Please be prepared for a long bus ride back to Beijing 2.5 hours to 4 hours depending on the traffic in Beijing. Prior to your journey back make sure you have urinated and can urinate. The day before the race purchase food, snacks, and fluids you can consume during the bus ride back to Beijing. After the 2.5-hour bus ride to the start, a long day running or hiking, your wait for the bus, and a 2.5-4 hour bus ride back home you are sure to be famished, please plan ahead. Buses to the start of the race in Jinshanling will leave the Renaissance Hotel at 4:00 am sharp. We suggest you are at the hotel no later than 3:30 am. If you show up at 4:00 am you have probably missed the bus and will have to find your own ride. In 2017 we asked our transportation guy to stay at the hotel and help runners that missed the bus get a ride, the stranded runners paid for their taxi ride to the start. 99% of all our runners made it to the hotel with plenty of time to spare. They wanted to get to the start early so they had time to use the facilities, drop off their drop bags, and stretch prior to their race. It is simply not fair to the runners that are on time and want to start the race on time if we wait for runners that choose to be late. THE RACE WILL START @ THE EARLIEST 6:00 am OR ½ HOUR AFTER THE BUSES ARRIVE IN JINSHANLING! You may not be able to go back to Beijing as soon as you finish. We require each bus is full prior to leaving, and yes the buses do leave as soon as they are full. The last bus will leave when the race has concluded, we have dismantled the race and all our volunteers are ready to depart. Our race management will know how many empty seats we can allow on each bus prior to their departure. Periodically during the race, we will ask how many runners want a ride back to Beijing. So just be patient, enjoy the party like atmosphere, buy a pijiu (beer) from one of the stands near the finish. In 2017 the cost was 10 ¥Yuan (about $1.47 USD or €1.31 Euro). They also had a few snacks, drinks, and souvenir’s you could purchase so bring some extra ¥Yuan (Chinese money), they will only take ¥Yuan (Chinese money) so make sure you have extra with you. Vendors were also selling ice cream, cold drinks, and snacks along the wall, at aid station 3 (East Gate) and aid station 6 (Gubeikou). Depending on Beijing traffic this ride could take up to 4 hours. The day before the race purchase food, snacks, and fluids you can consume during the bus ride back to Beijing. After the 2.5-hour bus ride to the start, a long day running or hiking, your wait for the bus, and a 2.5-4 hour bus ride back home you are sure to be famished, please plan ahead. There are bathrooms at the start/finish, Station 3, 4 and 6. If you need to go along the course please exit the wall in a safe location and use the great wide outdoors. Please don’t go on the wall it is considered disrespectful and you could be arrested if caught. We will offer a drop bags for all runners near the start/finish area. We will set up the drop bag locations after the buses arrive in Jinshanling, probably while the runners are waiting in the restroom line. So when you leave the restroom look for our signs they shouldn’t be too difficult to spot. Finish, Please put a change of clothes for after the race, food, water, or whatever else you might need prior to returning to Beijing. NO PERSONAL ITEMS that you can’t live without! Station 1, At the Generals House, runners will need to climb down a few flights of stairs to access this area. NO PERSONAL ITEMS that you can’t live without! Station 3, At the East Gate, 10k runners &marathon runners will access this area. Marathon Runners will access it twice. NO PERSONAL ITEMS that you can’t live without! Station 4, At the rural hostel on the trail around the military section of the Great Wall. NO PERSONAL ITEMS that you can’t live without! 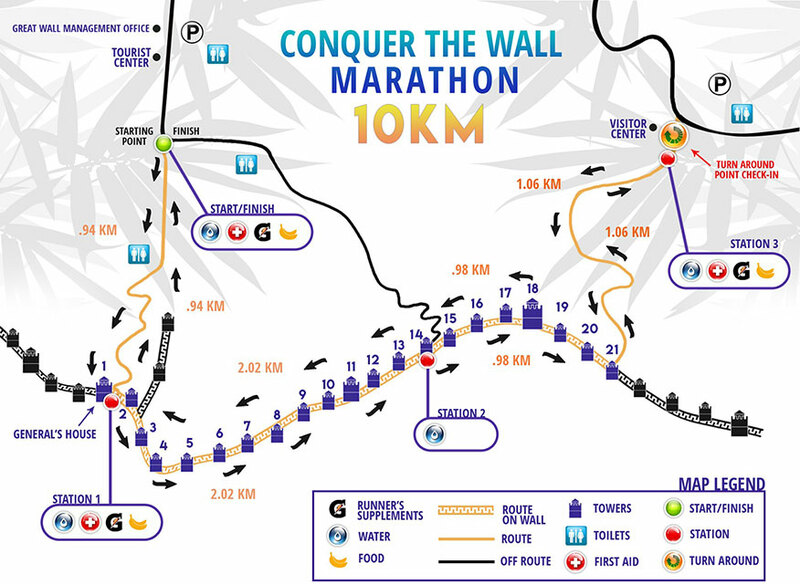 Station 6, In Gubeikou at the far west end of the wall, ½ Marathon & Marathon Runners will access this. This is the most preferred aid station to have your drop bags at. NO PERSONAL ITEMS that you can’t live without! Please don’t put anything valuable in ANY drop bag, ie car keys, hotel keys, cell phone, money, passport/visa, etc. When I am running an international race I bring a quart size Ziplock bag and put my visa, cash, hotel key and anything else important in it, then put it in a pocket in my hydration pack so I always have it on me. Only put items in your drop bags that you don’t care if you get back… This is very important! The full marathon course runs the Red Loop twice (X2) followed by the Blue Loop four times (X4). The half marathon course runs the Red Loop twice (X2) followed by a section of the Blue Loop (X1). The 10-kilometer course runs the Red Loop once (X1). The 5-kilometer course runs the Blue Loop once (X1). 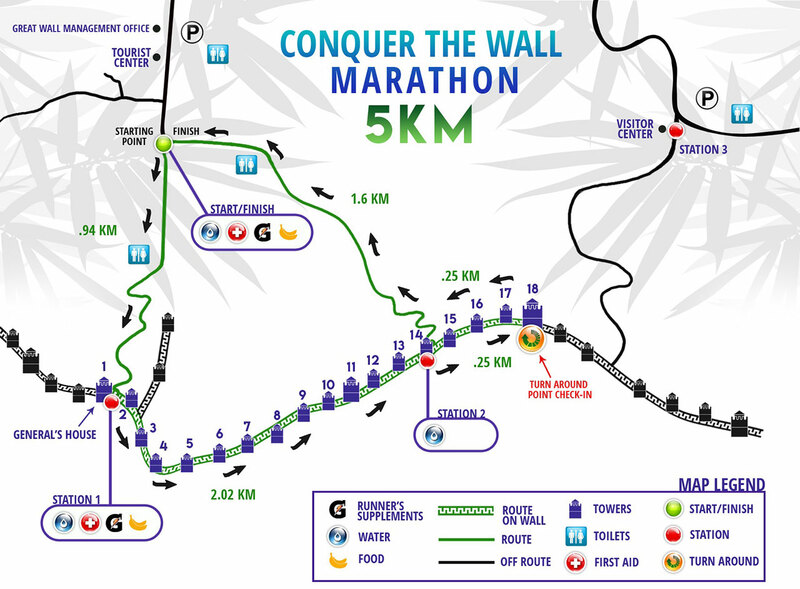 Conquer the Wall Marathon running course varies in height by around 200m (about 650feet) between the start line and the highest point. Stone guard towers are spread along the length of the wall, each some 200m to 300m apart. Stone steps, walkways and/or dirt paths following the up and down contours of the mountains. The effect this creates for runners is similar to interval training, with the extreme effort required ascending the towers, and followed by a recovery period descending the towers. Regular training on steps and/or hills as part of your preparations for the Great Wall is highly recommended. The course time limits will be STRICTLY ENFORCED. There is a 10-hour time limit for all races; start time is approximately 6:00 AM with a 4:00 PM CUT-OFF time. Participants must maintain a pace faster than the course time limits in order to complete the race. Note that start times are approximate. The mind of a champion! 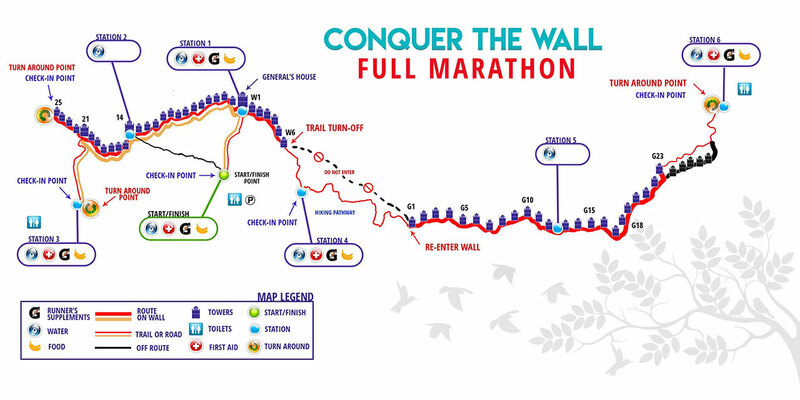 Conquer the Wall Marathon on the Great Wall of China is not your everyday marathon. This is an adventure marathon with a challenging course. Runners should be physically fit and in shape as this marathon can be extremely strenuous. We suggest using the training program to help condition your body to make your race experience unforgettable.